Surgicoll-Mesh is a bio compatible collagen mesh that is flexible, strong yet soft collagen membrane that is supple when hydrated and handles like natural tissue; it readily conforms to the surgical site upon application and is easily sutured. Surgicoll-Mesh is a reconstituted type-I collagen mesh free of contaminants like lipids, elastin and other immunogenic proteins. The collagen is used in the Surgicoll-Mesh product is based on a patented technology that ensures the high purity type-I collagen. It is processed under GMP conditions with stringent USP quality tests as per WHO (World Health Organization) and other international standards. Always handle Surgicoll-Mesh Collagen Matrix using aseptic techniques, Surgicoll-Meshmay form a calamel-colored gel, which can be rinsed away with gentle sterile irrigation. Surgicoll-Mesh should not be applied until excessive exudate, bleeding, acute swelling, and infection is controlled. Surgicoll-Mesh Collagen Matrix is derived from a bovine or ovine source and should not be used in patients with known sensitivity to such material. Do not re-sterilize. Discard all open and unused portions of Surgicoll-Mesh. 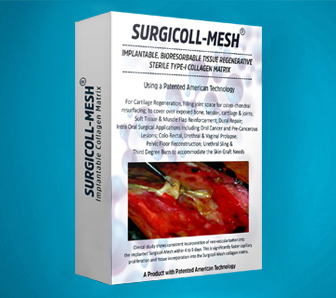 Surgicoll-Mesh is sterile if the package is dry, unopened and undamaged. Do not use if the package seal is broken. The device must be used prior to the expiration date. Surgicoll- Mesh Collagen Matrix is available by medical prescription only. Surgicoll-Mesh should be stored in a clean, dry location at room temperature. Do not store above 32°C to (90°F). Surgicoll-Mesh shelf life is 3 years.